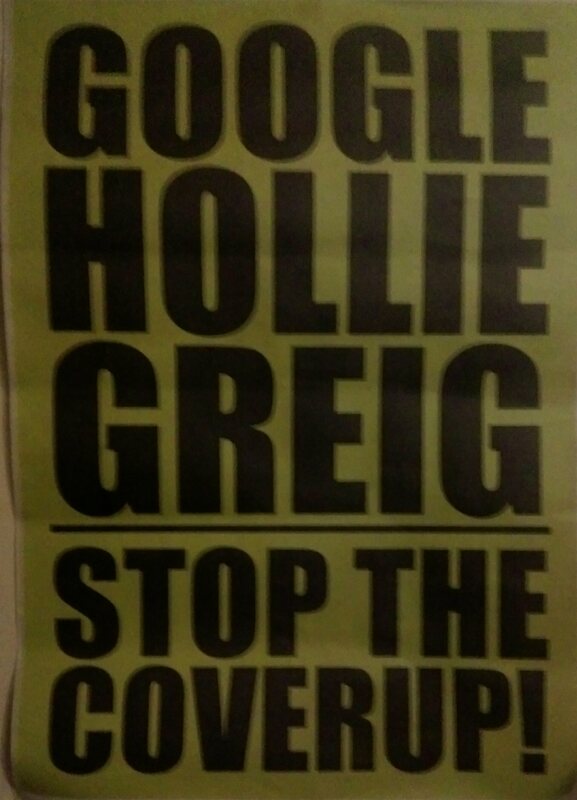 This pic was taken in April 2011 about 4 days after I paid £1 to have this “Hollie Greig” poster put in the window of the nearby local sub-post office [within a food grocery shop, now closed] for a couple of weeks. A poster was also put on a telegraph pole by this p.o. and was also taken down – they surely watched me put it up there by local cctv cameras. The post office “suddenly” had to have a new front to the shop put in so they had to take everything down, including my poster just after this pic was taken. How convenient. Even the print shop who made the 20 or so posters I had made closed down. But businesses close down, don’t they? Right. OK. I met the Nigerian Musa parents in Febuary 2011, who had 7 children stolen by Haringey council. and in November 2011 the Musas were remanded in custody courtesy of Sir Nicholas Wall at the RCJ – they went on to get a 7 year sentence each, for nothing, after a farcical trial. I used to go to HMP Pentonville / Holloway to visit Chiwar + Gloria, with other friends + supporters whilst they were on remand for 7 months and was followed there + back every time on each journey. I used to stay at the Musas for separate weeks at a time from March 2011 onwards after I met them earlier at a Trafalgar Sq. rally organised by Chris Wittwer, and used to be followed all the time too when travelling to where the Musas lived, in Haringey, N. London [where I was born] + back. The rogues knew everything I was doing as the coach station staff where I bought my coach ticket here used to tip them off after each purchasing of tickets – the same as when I use to use the train [even now] as my bank account is/was watched permanently too for ticket buying, etc., even though the local bank manager denied my account was being watched, as she would, when I met with her over something in January 2019 when I specifically asked again about whether my bank a/c was being monitored – she denied it adamantly. Maybe she doesn’t have the “need to know” anyway – who cares? If it isn’t being monitored now, which I believe it is anyway, it certainly was then [my emails too are monitored too anyway], so they got the times of the coach / train journey each time, and I would get off at Hammersmith, London every time when using the coach and get the tube there to Caledonian Rd. station – the station for both nearby prisons when visiting each Musa regularly. It was easy to notice the plain clothes, often standing close to me in the lift at Cale. Rd. tube station, stupidly staring and watching me after I exited the tube train and I would be followed all the way back home after the prison visit too. Even when I used to go to Maurice Kirk’s court hearings over the years in Cardiff they would follow me on the trains there and back as they hack my bank account and see what I’m doing, and if train tickets are bought. This rancid surveillance continues to this day, and during the recent years now they employ close neighbours to do their dirty work, along with Royal Mail postmen and many strangers all over the place too – more to annoy than to do anything actually positive [such as?]. The council, R. Mail, NHS + so many more agencies are all involved in these hostilities – all begun by one cop I met in 2010 after receiving dodgy messages on my phone and having to go check it out at my local police station in case these messages contained illegal photographs, or whatever. The cop I spoke to that day was such hard work. I know his name and number [he refused to tell me his name at first – I was told it later after I made the point that I’d asked him his name but got the response “take my number – it’s easier” as he looked at his shiny number on his shoulder]. I’ve complained many times over the years to authorities about what’s turned out now to be a completely baseless stalking campaign waged against me whereby they would recruit stalkers by telling them I needed watching as I was involved in crime and their help was required to help catch me. I was even told this by a stalker who I spoke with, who also gave me an formal affadavit regarding things. Although I’m not engaged in anything illegal [they would love to charge me if i was], this is how they justify their outrageous and intrusive AND ILLEGAL smear campaign and bs stalking and pathetic surveillance. The gay creep who lives in the flat opposite me -10 feet from my flat door – watches me intently, constantly slamming his door going in and out all the time for no reason other than to be heard. I try to always let them know I know what’s been going on – in the name of what? 8 sheets of complaint went to the Home Secretary recently, along with 6 other “high rankers” – and not for the 1st time. A local MP acknowledged my letter, and sent it to another local MP, as did others written to. The rogues have actually achieved nothing other than to make themselves look very stupid, and waste a lot of public money over the years, and police time and got nothing for it – neither their amateur attempts to get me to break the law via their numerous entrapment attempts, or by trying to get me to react negatively to their daft stalkers [via an offence of ABH or whatever against any one of these sad persons] who are often elderly housewives or males, or teenagers, even small children have been used to bait me, I believe, into some nefarious act, homeless people have been employed, people have been sent often to knock on my door asking for the Class A drug abuser who lives next door – the list goes on and on. An unknown male, who I firmly believe was employed as a stalker, made a “death threat” to me as I stood awaiting a bus at the nearby local stop where so much has happened regarding their stalking over the recent years – my getting a crime number for this event proving a waste of time as the local police simply refused to investigate the threat properly. My complaint about these police’s “dereliction of duty” to the then IPCC was swiftly rerouted back to the same police who had failed to investigate this serious crime in the first place – my local Dorset police, and that was that. Unbelievable. Later and further similar “death threats” by a known individual also remain undealt with by 2 police forces, including my local force, naturally. On a day between Christmas Day 2017 and the New Year then an elderly male character knocked on my door around 6pm and was holding a plastic container. He spoke, claiming “here is the food you ordered”. I hadn’t ordered any food from anywhere and told him “thank you” – and go away, realising this obvious trap. They disguise their stalking via some fake “kind act” so as to confuse the issue, but I am not deceived. All has failed miserably for years now. This is illegal surveillance and is against Article 8 of the European Convention on Human Rights – which provides a right to respect for one’s “private and family life, his home and his correspondence” despite the intrusive “SNOOPERS CHARTER”  now law, which they think will protect them from, often, the very serious harassment they dish out so often. On the 10th April I found a letter Maurice Kirk had sent me from HMP Cardiff – full of legal documents – on my front door doorstep. The following day I was given 2 letters addressed to a woman who lives next door – I opened one of these letters, thinking automatically it was addressed to me to find it contained the woman’s new bank credit card – pristine, and with a letter from her bank. I immediately found her half an hour later and gave her the mail meant for her but given to me and reported both matters – the letter I found on my doorstep, and this misdelivery of someone else’s mail – to the R. Mail CEO but didn’t even receive an acknowledgement message to my email to the CEO. These actions by R. Mail are just the latest in a long line of malfeasance going back years performed by these regular postmen to my home. I doubt if I’ll receive any real response from the CEO anyway. I have built a folder of pics of scores of different stalkers taken at different times and locations over the recent years – often of the same stalker but at a different place and I have numerous audio recordings of both mobile and landline phone calls where it is obvious the call is being compromised, with, eg., beeping noises regularly or at random times throughout the call, or other similar anomalies – strange noises, or being cut off even mid-call. My landline phone was turned off by “persons unknown” a couple of weeks ago and I haven’t got it turned back on, as what is the point? During a long mobile phone call to a quite well known activist a couple of weeks ago the call was cut off completely after about 15 minutes and my phone screen started flashing like mad and the call audio kept stopping and starting very strangely just before that, before they cut the call off completely. The hackers want you to think it the person you are speaking to in the call that is messing around but I know at least he couldn’t have made my phone screen flash as it did over and over. How many other perfectly law abiding citizens have suffered what I have been forced to experience over the years – especially the more recent targeting I’ve experienced after I learnt of Carol Woods awful harassment in Febuary 2016 and began trying to support her? Carol Woods is chronically targeted up in Lancashire – maybe because of this? = “York LGO Blog re Lancashire Co. Council http://criticalreader2006.blogspot.ae/ – she states: “you will see why I am hounded by lowlife RECRUITED to do that by the Gestapo. More is described here: “Harassment as punishment for whistle-blowing: Lancashire” http://criticalreader17.blogspot.co.uk/2017/02/ “. I admit I’ve been suicidal during the recent past over these never ending hostilities and the only thing that’s stopped me is knowing this is exactly what they want. I would return for them anyway, which goes without saying. But if I’m forced to think like that what is happening to those targeted like Carol Woods along with others who are greatly harassed much worse than I am by these monsters? Trying to get legal representation to stop this corruption has continually proven a waste of time – it is surely rigged in that department. Over 130 posts / reports on Carol Woods’s case with updates coming directly from her since Feb. 2016 have been archived = https://butlincat.com/?s=carol+woods . None of this reporting is illegal and I have no criminal record but watching and reporting on the outrageous malfeasance and corruption of certain rogue UK government employees has made me nearly take my own life due to this unwarranted targeting – serious long running never ending problems with the DWP hasn’t helped either [I’ve just had to issue a FOIA [SAR] request to them [see their acknowledgement letter below] as they refuse to tell me the result of an investigation their “OCU Investigation Team 3” was apparently undertaking after they contacted me in August 2018 regarding numerous serious complaints I made that were completely and contemptuously ignored by the DWP. 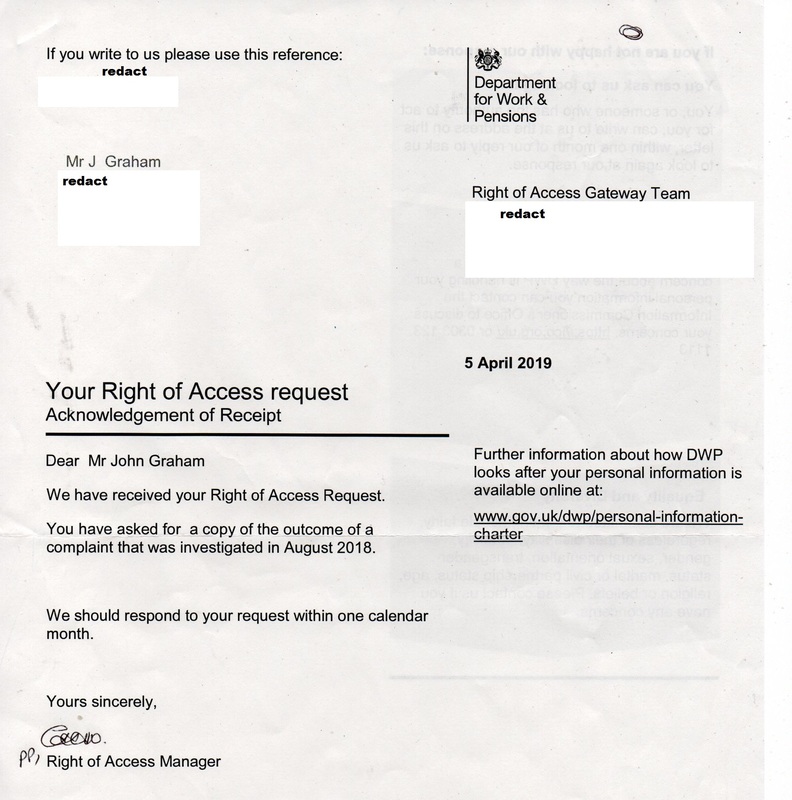 A couple of weeks ago I was sent £100 by these people for “maladministration” as so many recorded delivery letters had been sent – some asking over and over again for help but were totally ignored by eg. 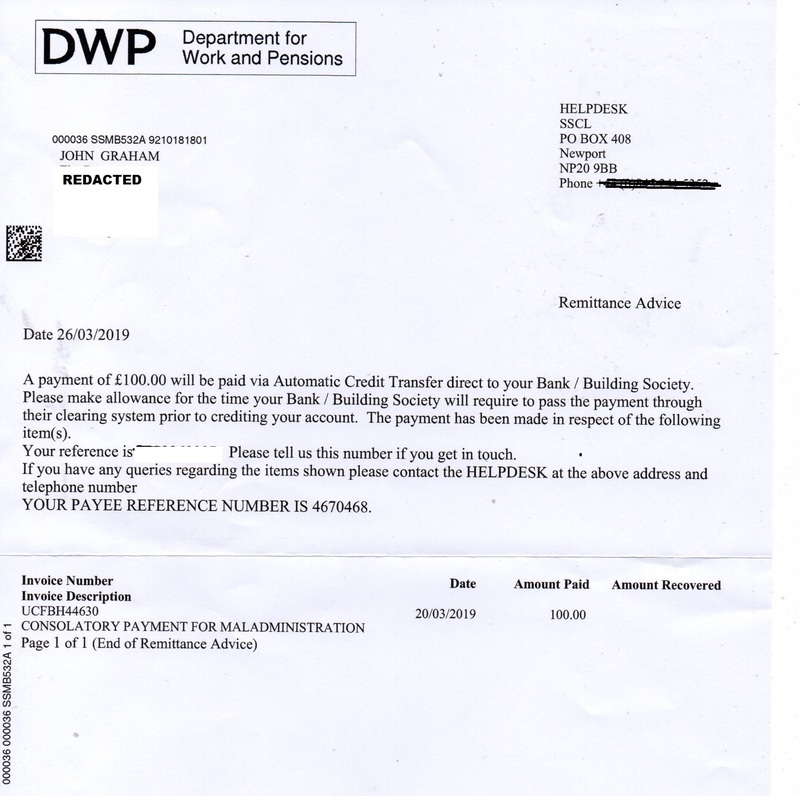 my local jobcentre, this £100 being given to the “Defend Assange” organisation. The rogues involved in the targeting are sadly protected by even the more honest and decent govt. employees for reasons only known to them, which is a great shame because what these rogues do is so destructive and hostile it is no wonder victims of their corruption often commit suicide, and the general public often have no clue what is actually going on in the background of that victim’s life eg. lay legal expert Patrick Cullinane met a mysterious demise not so long ago whereby he was supposed to have deceased [but no body was witnessed being taken from his abode at the time, as reported by friends who were at the location at the time, allegedly], but already in his life he had suffered great harassment at their hands – even waking up in Lanzarote once with the previous 3 days of time he couldn’t account for, or the time they tried to section him and keep him in a closed asylum before he got away and fled to freedom. Others weren’t so lucky – Andy Lowe MacCardle died under highly questionable circumstances after being put in a closed mental unit after he discovered and tried to report an [alleged] drug racket connected to Strathclyde police. George Gretton suddenly died a couple of years ago – alleged heart problems was given as the reason. Reporting and supporting those on the receiving end of grotesque corrupt practices by certain authority personnel is not against any law but gets you treated worse than any criminal is. They are so very evil and can do anything and much has happened I cant even be bothered to report on, such as when they messed with my electricity supply for months, or when they messed with my broadband connection for months, and much more. This entry was posted in Uncategorized and tagged my, stalkers. Bookmark the permalink.